On Mondays, a lot of museums and galleries sleep. Not PalaisPopulaire: This art space offers free admission and special tours under the programmatic title “I like Mondays”. What is PalaisPopulaire? 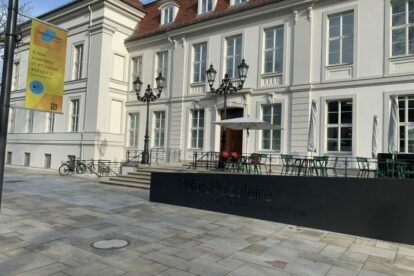 The former Deutsche Bank KunstHalle, which recently changed their location from the office building of Deutsche Bank to the historical Prinzessinnenpalais – hence the name PalaisPopulaire. The concept is still the same: The art collection by Deutsche Bank, often in cooperation with international museums, opens itself to the public and the foundation behind it also supports young artists. For “I like Mondays”, I used to be one of the student guides so I can tell you a little bit from behind the scenes. The so-called live guide engages in conversations with each visitor who is interested or curious enough. The tour does not need to be booked in advance and is often triggered by an overheard conversation or because someone reads out loud the slogan in the guide’s sweater: Talk to me?! For me, personally, I really enjoyed talking through each and everyone’s questions and thoughts, literally living up to one definition of art: to start a conversation.